Students at Bishop Smith Catholic High School (BSCHS) can explore career options in the health care field in a spacious new learning environment. “The changes are truly remarkable and very reflective of the post-secondary environment,” says Teacher Carol Plue about her specialized classroom. In March 2015, the Health Care course and the Specialist High Skills Major (SHSM) – Health and Wellness program relocated to a larger, remodelled classroom that provides much more room to carry out class activities. Features include a separate computer/work area, in-class hand washing, and a mock hospital room. Students are enjoying the improved space. “We can experience more hands-on learning,” states grade 12 student Alisha Miller. 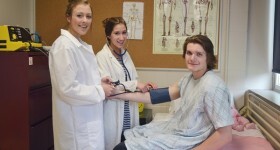 Guest speakers and field trips (e.g., visits to the nursing lab at Algonquin College) help round out the health care learning experience at BSCHS. Amongst the students in Plue’s grade 12 classes and the SHSM program, choices range from nursing to psychology, social work, and personal support worker to kinesiology. The SHSM – Health and Wellness program can also give students an advantage when applying to college or university and in their first-year courses. “Students in the SHSM earn certification, for example Standard First Aid and CPR, that is often required for college and university courses,” notes Plue. Photo: Matt Brooks, Myra Giroux, both going into university nursing programs in the fall and Christina Barone (striped shirt) going into kinesiology all agree that the new classroom allows more hands-on experience and provides a good learning environment.